Missouri Governor Jay Nixon has announced plans to call a special session of the Missouri General Assembly this week in order to allocate additional funding for the National Guard occupation of the St. Louis Area. The move comes amid continued nationwide outrage over the judicial whitewash of the police murder of Ferguson teenager Michael Brown, after a grand jury refused to bring charges against his killer, Darren Wilson. The announcement marks a signal by Nixon that there will be no roll-back of the National Guard presence in the city in the near term, despite the fact that there has been no sign of violence or looting in recent days. Nixon more than tripled the number of troops in the St. Louis region last week, from 700 to 2,200. “Swift action is necessary to ensure both that these brave men and women can be paid on December 15 for their hard work on behalf of our state and that the resources necessary are available.” Nixon wrote in a letter to lawmakers Saturday. Nixon declared a state of emergency and activated the Missouri National Guard on November 17, ahead of the expected grand jury decision, which came exactly one week later. Since then, the National Guard has had a significant presence in the area and has carried out arrests at demonstrations. This rationale for arrogating emergency powers and deploying a branch of the Armed Forces is so broad that it could be used under practically any conditions in any American city. The preemptive deployment of the National Guard to Ferguson, and their continued use, marks the latest step in the drive by the US ruling class to accustom the population to an ever-greater presence of the military in all aspects of political life. The methods used by the military abroad are increasingly being applied against domestic opposition within the United States. 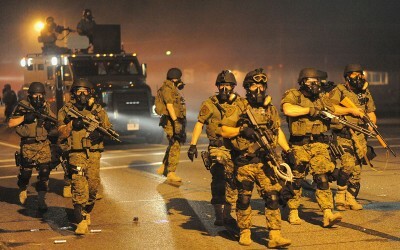 The crackdown in Ferguson follows the imposition of effective martial law last year in Boston, where residents were told to “shelter in place” after the Boston Marathon bombing, as police in combat uniforms conducted house-to-house searches and armored vehicles rolled through the streets. During the initial protests in Ferguson in August, Nixon used the state of emergency to essentially suspend the First Amendment right to freedom of assembly by declaring that protestors would be arrested unless they kept walking. This was accompanied by a massive crackdown by the police, backed up by the National Guard. Police officers dressed in combat fatigues pointed assault rifles at peaceful protestors, shot demonstrators with tear gas and rubber bullets, and arrested over a dozen reporters. The latest declaration of a state of emergency by Nixon is aimed at setting a new precedent. While the police response has been just as violent and brutal, it has been accompanied by a far larger deployment of National Guard troops and their direct use to suppress protests. These measures have been carefully coordinated with the Obama administration, which has also sent 100 FBI agents to Ferguson prior to the grand jury decision. The continued military lockdown has drawn almost no attention in the press. While the Sunday talk shows were fixated on portraying the protests in Ferguson as expressive of “racial tensions,” the continued military lockdown in the city went largely unmentioned. To the extent that the issue has been raised in the media, Nixon was criticized for not making sufficient use of the National Guard. Local media reported late last week that police blinded a pregnant woman in St. Louis Tuesday, the day after the announcement of the grand jury decision, by shooting a bean bag round through the window of the car she was sitting in. Dornella Conners, who is three months pregnant, lost her left eye, and partially lost vision in her right eye. Darren Wilson announced Saturday evening that he would resign from the Ferguson Police force, and city officials said Sunday that he would not receive severance pay. Ferguson Mayor James Knowles also announced plans to “diversify” the local police force by offering officers financial incentives to live in the city of Ferguson. These measures are calculated to give the appearance of change in response to the protests, while masking the far more important reality that no charges have been brought against the killer cop, and that the entire incident has been used to even further militarize American society.